Halifax AFL fixture secretary David Rattigan has admitted to growing worries about a mounting fixture backlog after heavy rain throughout the winter. Only four games were played on Saturday and the experienced Rattigan said: “The backlog is starting to be a concern, especially if we are still to get some real winter weather, which I’m sure we will. AFL officials have called off the whole programme in advance on occasions this winter but Rattigan said it had been the right thing to do. “Despite the frustration of having weeks with very little football, we are still better off not playing on pitches where damage will be done to them which would result in even more games being lost. 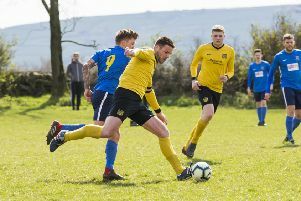 “At the moment, with 12 Saturdays left in the season, the Premier Division teams are not too badly off with the possible exceptions of Shelf United, Ryburn United and Warley Rangers. “The first division is where big problems could arise. Rattigan said Sowerby Bridge, Ryburn United, Calder ‘76 Reserves and possible Halifax Irish Centre were also facing a busy end to their seasons. Rattigan said officials and players were desperate for an improvement in the weather. Some Halifax Sunday League clubs also face a hectic finish to the season.